The Dreaded Evaluation: We all have them! Evaluations can be a source of discomfort. We are all accountable to someone higher up, and the pressure is on to perform. This resource includes a compilation of current concepts, buzzwords, and strategies that administrators are looking for in the 21st century. Included is a bibliography to give validity to the information. 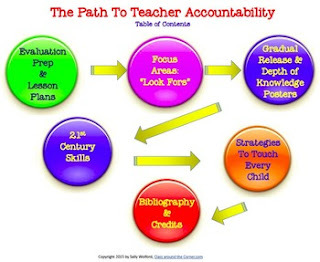 Having been a teacher for some years, I’ve seen the accountability pendulum swing back and forth, picking up new concepts and buzzwords and dropping old ones. Now in the 21st century, with new stresses in American classrooms, teachers face a new approach to accountability--with new concepts and buzzwords (even though some of them remind us of old ones). As part of the leadership team at my school, I collaborate to do classroom walkthroughs, looking for evidence of differentiated accountability. As a result, I have gathered pieces of information that I value and refer to often in order to help build the accountability awareness needed in today’s educational climate. You are probably experiencing the same things I and my professional peers are experiencing—still loving children and learning, but feeling frustrated over the time it takes to write lesson plans and to prepare for the differentiated accountability we face each day. As a life-long learner myself, I join with you in wanting to “sort it all out” and still see that teaching is more than just a science—it is an art—it requires craft. I think the new buzzword for that is teacher with-it-ness. P.S. Sometimes teachers will ask me for a lesson idea for an upcoming formal evaluation. I share with them some of my Teacher Pay Teachers resources because they are based on lessons that were successful, simple, and engaged children in authentic learning, while following state and district standards.